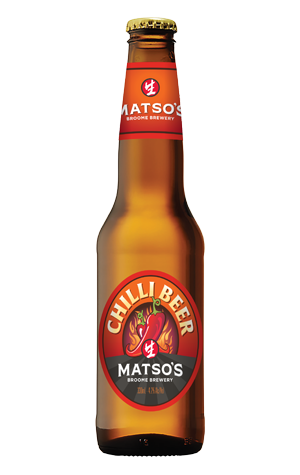 An ambush in beer form lies in wait for any drinkers approaching their first Matso's Chilli Beer unawares. Pop it in a glass, give it a swirl and bring it to your nose and you might surmise you've got an easy-going amber or a malty English ale in front of you. Maybe you'll pick up a faint chilli perfume, maybe not. There's no mistaking what you've got in your hands once it hits your lips however... BOOM! The heat derived from cayenne chilli speeds through the olfactory system all the way to your ears within a couple of mouthfuls and your chest not much later. It makes for a beer that's not merely an experience but could be diagnosed to anyone needing to clear their sinuses. Indeed, the people behind it are aware of the potency, suggesting those after a milder hit blend it with their Ginger or Mango offerings to take the edge off.